This small tree or large shrub is native to our area and is well known for it's smooth, thin bluish-grey bark. 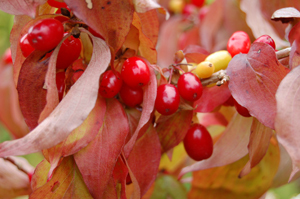 It has striking orangish-red fall foliage and it will tolerate wet soils and fairly heavy shade. It has tiny greenish catkins in early spring that eventutally form small ovalish green seeds in summer that provide food to butterflies and other wildlife. It will grow to about 30 feet tall. Also known as Upright European Aspen, this soil tolerant, fast-growing, disease-resistant tree reaches 40 ft. tall but will only spread 10 ft. wide in full sun. Like Quaking Aspen, long stems allow green, silver backed leaves to shiver in any hint of a breeze. Fall leaf colour is orange to red. 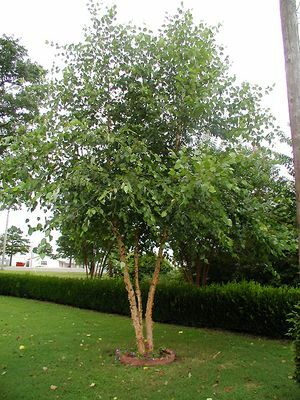 Great as an accent tree for a small lot or in a group for screen planting. Abundant early spring yellow flowers cover this multi-stemmed small tree in all its 'Golden Glory'. Large 1" long red edible fruit follow that attracts birds and can make for delicious preserves. Dark green leaves turn purple-red in the autumn, complementing its peeling gray-brown bark. It grows to 25 ft. tall in sun or part shade and is both drought tolerant and deer resistant as well. ** Available by special order. 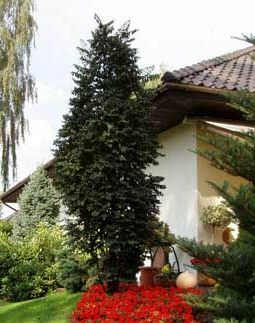 A unique, slow-growing columnar tree with dark green leaves that turn reddish in fall. 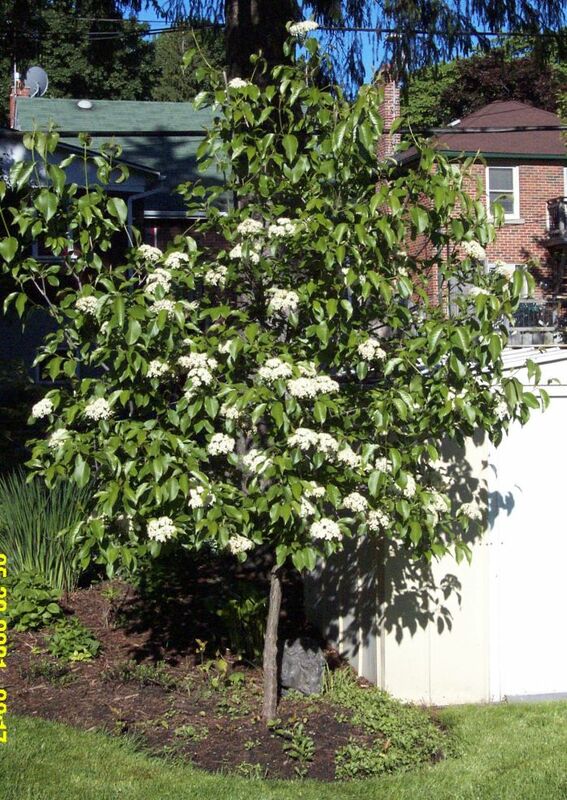 Strong upright branches with clustered white blossoms in late spring that turn to vivid red berries in the fall. A very cold hardy tree that will grow 3 times as high as wide to 35 ft. in sun and in well drained soils. This exceptional lawn specimen not only is the most insect and disease resistant birch available but it also thrives in both wet and dry conditions. It has beautiful peeling bark that when the tree is young is cream to white, but that matures to gray, cream, orange and lavender tones. It grows well in sun or part shade to 25-50 ft. tall and 25-35 ft. wide, yet is neither brittle nor messy like many other birch species. 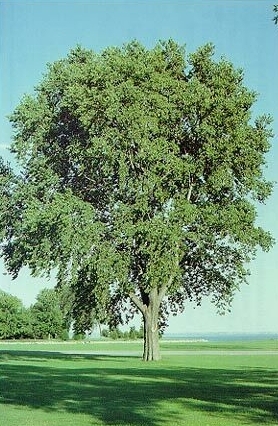 This shapely, rounded native tree bears yellow green leaves which deepen to glossy green in summer. Creamy flat flower clusters that bloom in June form clusters of small green fruit that are tinged with yellow, rose, pink and then finally bluish black. Fruit are highly desireable for birds and other wildlife, and are edible. 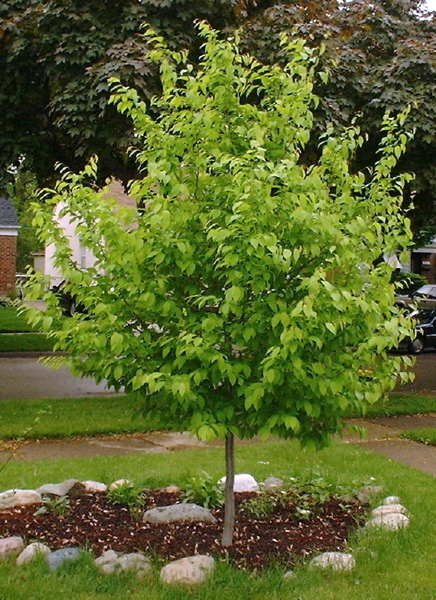 Tree grows well in both sun or shade and could grow to 15 ft tall by the same wide. Foliage in fall is striking deep purple.